Three unique days, three one-of-a-kind yachts to experience! 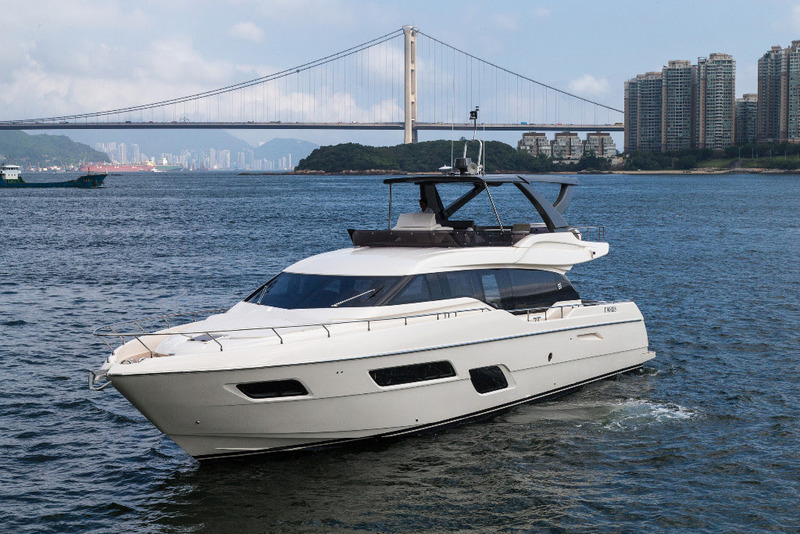 Ferretti Group Asia Pacific announces the 2nd edition of its 'Open Days', to take place at the Groupâ€™s Service Centre in Hong Kong, 10th to 12th June 2016. On display: three Ferretti Yachts in the 'Tai He Ban' special edition: Ferretti Yachts 960, Ferretti Yachts 870 and the brand new Ferretti Yachts 700, Asia Pacific premiÃ¨re. 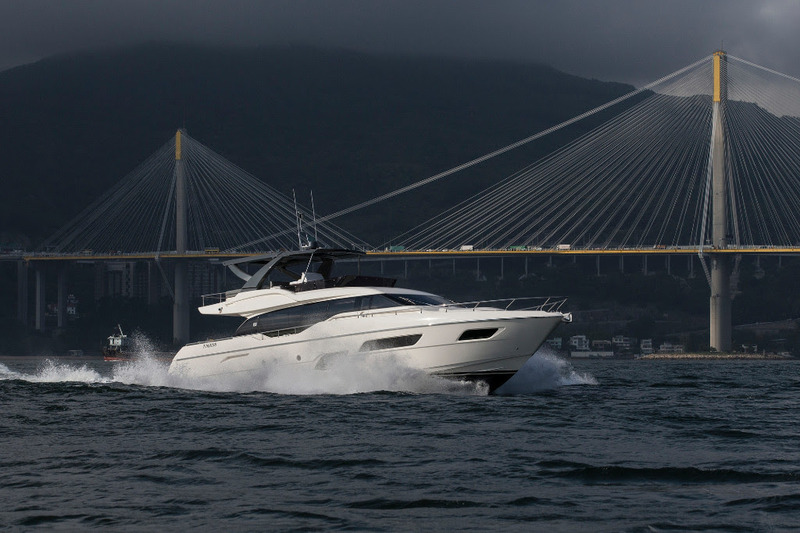 Following on from the first edition in March, Ferretti Group Asia Pacific is ready to welcome guests to another â€˜Ferretti Group Open Daysâ€™ weekend at its Hong Kong Service Centre, in Aberdeen, Hong Kong. On display will be three amazing Ferretti Yachts maxi flybridge yachts, all in the 'Tai He Ban' special edition: the brandâ€™s flagship Ferretti Yachts 960, the Ferretti Yachts 870 and the Ferretti Yachts 700 â€“ showing in the Asia Pacific region for the first time. The three motor yachts are the outcome of the long-standing cooperation between Zuccon International Project and Ferretti Group's Engineering Department, representing the epitome of style, elegance and performance; the pinnacle of Italian craftsmanship driven by even finer Italian design, and backed by the ultimate in Italian engineering. With the â€œTai He Banâ€ special edition, Ferretti Yachts has fine-tuned their already-perfect yachts to a new level of excellence aimed specifically at the Asian market. Through unique and particular surface finishes, trims and upholsteries, Ferretti Yachts have delivered something new and exclusive. The Ferretti Yachts 700 'Tai He Ban' on display is an absolute first for both Hong Kong and in the Asia Pacific region. It has an aggressive, streamlined profile which is one of the most sporty in the brand's history. The aerodynamic design is particularly evident in the lengthened flybridge, with satellite systems and antennas housed in the Vulcan Grey roll bar above. The long glazed surface on deck runs from stem to stern, â€œcuttingâ€ through the profile of the yacht. This flybridge yacht can accommodate up to six guests: just perfect for a long weekend with friends. 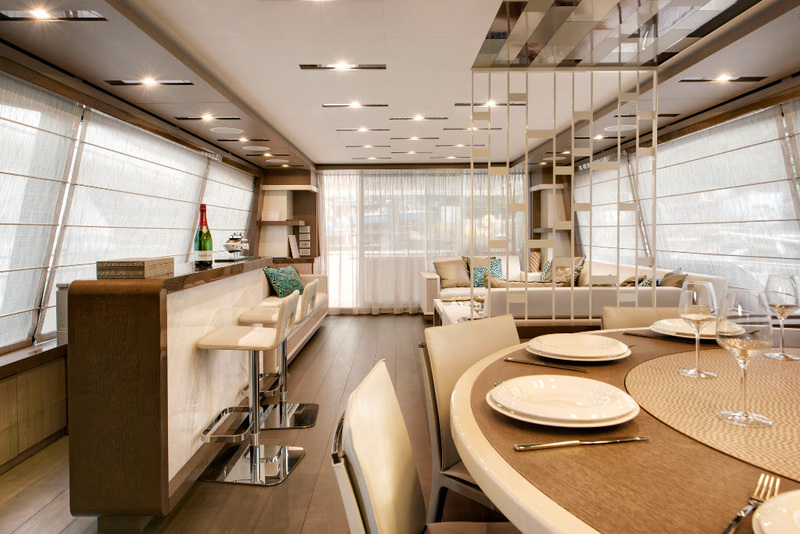 The breathtaking one-level walk-through saloon stretches all the way from the aft cockpit to the helm station, and the windows let in so much light they may as well not be there at all. The brand's largest-ever planing yacht can be used as a pleasure vessel even without a professional captain. This flagship yacht offers three engine options, all from MTU. The Ferretti Yachts 960 â€œTai He Banâ€ on display in Hong Kong is equipped with a pair of 2,638hp 16V M94 engines. It can reach a maximum speed of 30 knots and cruise at 26 knots: amazing performance from a vessel that boasts a sumptuous interior decor features such as marble surfaces and back-lit onyx panelling in the saloon. The Ferretti Yachts 870 â€œTai He Banâ€, that saw her sister launched and sold during the Hong Kong Gold Coast Boat Show 2015, is now displayed and ready for sea trials. 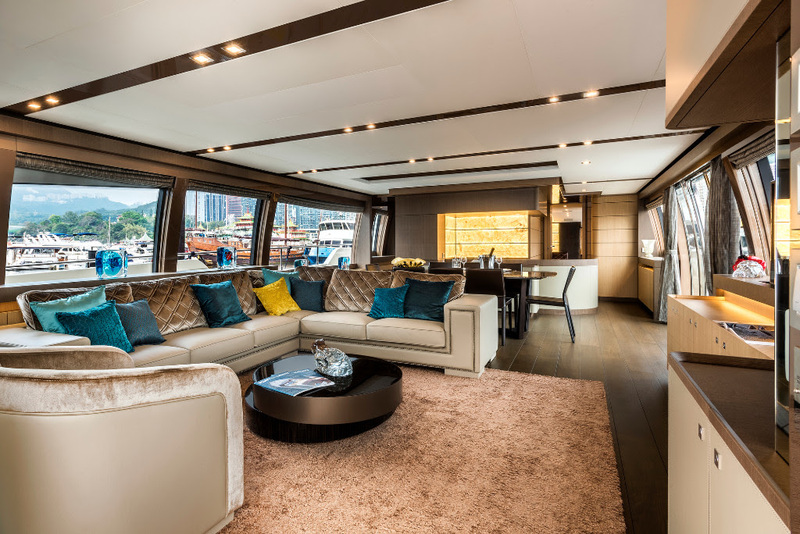 The interior layout, on both the main and lower decks, has been entirely redesigned and customised, with the bar unit to starboard featuring a high-gloss wooden top and a semi-precious onyx panel front. The lower deck layout stands out for the flawless arrangement of the areas devoted to entertainment and the guest accommodation. Moreover, this editionâ€™s interiors have been specifically designed to host business meetings and official receptions as well as informal events, and its dÃ©cor solutions have been carefully developed to suit this purpose. The Ferretti Group is a world leader in the design, construction and sales of luxury motor yachts and pleasure craft, with a unique portfolio of prestigious and exclusive brands: Ferretti Yachts, Riva, Pershing, Itama, Mochi Craft, CRN, and Custom Line. Led by its current President Tan Xuguang and CEO Alberto Galassi, Ferretti Group boasts modern shipyards, all located in Italy, that combine industrial production efficiency with the inimitable attention to detail that is typical of â€˜Made in Italyâ€™ craftsmanship, embodying the legacy of centuries of Italian shipbuilding tradition. Founded in 1968, the Group operates in the United States (with its subsidiary Ferretti Group America, which manages a network of sales outlets and dealers specialised in marketing the Groupâ€™s brands throughout the North American market), and in Asia (through its subsidiary Ferretti Group Asia Pacific Ltd., based in Hong Kong, as well as through Representative Offices and sales centres in Shanghai, Qingdao, and other locations in China). A highly specialised network of around 60 dealers provides the Ferretti Group with a presence in over 80 countries, and assures its customers the highest levels of assistance available on the world market. The Ferretti Group has long been a leader in the pleasure craft industry, thanks to its ongoing product and process innovation and its constant quest for cutting-edge technological solutions. 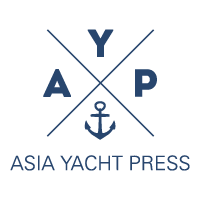 The wide range of boats offered (flybridge, runabout, open, coupÃ©, lobster boats, maxi and superyachts) is developed by the Groupâ€™s Strategic Product Committee, Marketing Department, and Engineering Management. The aim is to develop innovative aesthetic and functional solutions, working in close collaboration with internationally renowned external architects. In world shipbuilding circles, Ferretti Group vessels have always been known for their supreme quality, high level of safety and outstanding performance at sea, as well as for their exclusive design and timeless appeal.